Introducing our newest team member or should I say family member Maximus aka Maxie. 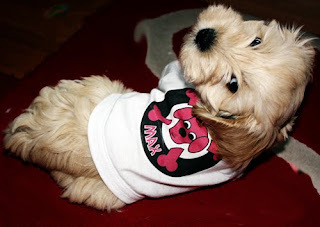 Here is Maxie our 8 week old spoodle who Sienna my eldest now 5 1/2 absolutly adores. Now If only I could get her to pick up her toys as much as she picks him up my house would be spotless! I could not help myself I had to make Max his very own doggy IdTee. I would like to make this blog a showcase to the many facets that is IdTee. I see this as a great opportunity to communicate with you and share aspects of my life. One week it could be Idtee news, the next something that inspires, and or news about other designers and special offers only availble through this blog. I hope you will enjoy!